Home � #MomsDayGiveaway , Aerosoles , Comfortable Shoes , Enter to win , Flats , Gifts for Mom , Heels , Mother's Day , Mother's Day Style Quiz , Shoeography , Shopping Spree , sweepstakes , Women's Shoes � Sweepstakes Alert: Win some Aerosoles Shoes for Mother's Day! 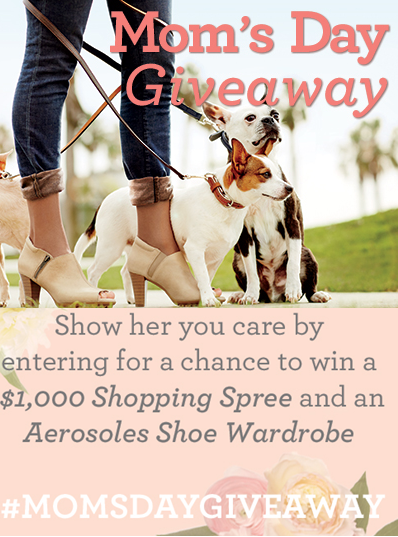 Sweepstakes Alert: Win some Aerosoles Shoes for Mother's Day! You can tell a lot about a person by their shoes. Aerosoles is helping you find your Mother's Day style with their newly launched quiz. Find out which Aerosoles comfortable shoe styles are best suited for you. Whether you are a mom on the go, a trendsetter, an entertainer, a networker, or an athletic mom, the Aerosoles Mother's Day Style Quiz will help determine which shoes are your perfect picks. We already know which of these cool women's shoes are our go-to, why not find out yours. After you've found the perfect shoes for your personality, you can enter Aerosoles' Mother's Day Facebook Sweepstakes, launching tomorrow, April 30th. Enter for the chance to win a $1,000 Shopping Spree, and an Aerosoles Shoe Wardrobe, by entering on the brand's Facebook page.